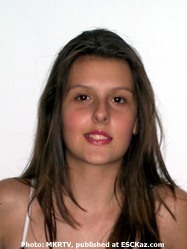 Sara Markovska was born on 27th of June, 1995. 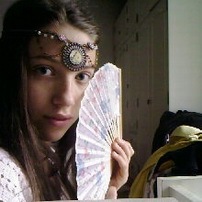 She lives in Skopje and studies in 8th grade of "Jan Amos Komenski" school, she is an A student. When the new school was built, Sara has the honour to sing the school anthem. Sara's greatest passion is singing and dancing. This year she has been graduated from the music school "Ilija Nikolovski Lui". Her solfegio teacher is Ana Kostova and her piano teacher is Maja Popovic. Now for a year and a half she is taking private singing lessons with professor Vlado Srbinovski. "Music is my greatest love. 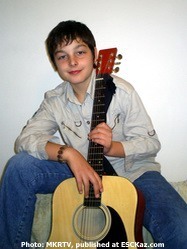 I know for sure that when I grow up, I will become known singer in Macedonia and Balkans. I adore art, singing and dancing", says Sara. 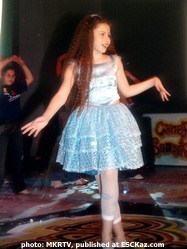 Sara also has been attending dance classes since she was five years old and for 6 years studied in the music college. She has been a member of many ballet groups such as "Mak Models" and "Rebis". For the last 6 years she is member of hip-hop and modern jazz dance group "Eureka", her choreographer is Katerina Jolakovska. 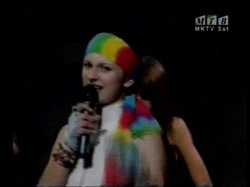 As a singer, Sara took part in many festivals. In international festival "Zvezdicki" (Asterisks) in Prilep, Macedonia she performed in 2006 (3rd place with "Sama niz Sahara (Through Sahara on my own)), in 2007 (2nd place with "Zvezdite ne lazat" (Stars do not crawl)), and in 2008 (3rd place with "Tie ochi sini gde" (Where are those blue eyes)). She also took part in festival "Musicko cadorce 2007" (Music Umbrella) in Vinnica winning 2nd place, and in 2008 took part in another festival in Ukraine, in Mariupol (2nd place). She also took part in "Proletni zvoncinja" (Spring bells) in Strumica, Macedonia, in 2008 got 3rd place at "Male Skale" in Herzeg Novi, Montenegro performing "Ljubov i muzika" (Love and Music), and in 2009 another 3rd place at festival in "Sun, Joy and Beauty" Nessebar, Bulgaria performing "Vremeto ce ni kaze" of Lazar Cvetkovski, and others. 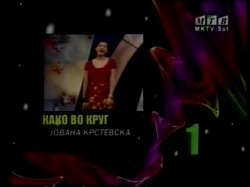 She also took first place for the stage performance in teens festival "Super Zvezda" with "Signali na ljubovta". 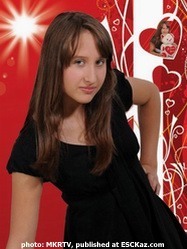 In 2007 Sara has took part in Junior Eurovision preselection with "Mislish na mene" (You think of me) finishing 2nd and the same year she backed Rosica and Dimitar at JESC in Rotterdam. 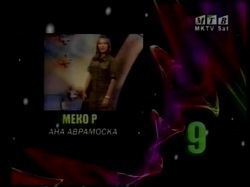 In 2008 she performed as guest of the preselection also performing "Ljubov i muzika". In her spare time, apart from dancing and singing, she attends English classes at NOVA school. "Besides music, I like foreign languages, mathematics, and participated in an international children's art exhibition, and also completed a fashion course in Studio Crnokrak and was chosen as face of the newspaper "Nash svet". She also likes spending time with friends, riding on bike and roller skating. Sara likes listening to pop music and RNB. Her favorite home singers are: Tose Proeski, "Next Time", Tamara Todevska, Lambe Alabakovski and from international ones she likes Beyonce, Celine Dion, Chris Brown. She likes to roller skate and hang with her friends in my spare time. Her great wish is to travel in many countries. "We have got a wonderful winning song, which during the next two weeks we will work on and then officially submit in Kiev. Some work on stage presentation should also be done to ensure that our country is represented in the best possible way. Sara is competely ready for the challenge and we hope that everything will be OK", said Rade Spasovski, head of the delegation. "I hope in Ukraine we will be successful. Last year, our representative Bobby Andonov was fifth in Limassol, Cyprus, and now we wish Sara victory in Kiev", said Ljupco Mirkovski, artistic director of national preselection. "No words can describe how I feel now. Although I hoped for victory, and worked hard for it, I am very excited and happy. For this I have to say thanks to my professor of solo vocals Vlado Srbinovski, Aleksandar Masevski who prepared arrangement for the song and, of course, the girls from dance-band "Eureka" that were with me on stage", said excited winner. Sara's elder sister Emi Markoska (who also helped Sara to write song lyrics), Boyana Nik, Jovana Ivanovska and Bisera Martinovska accompanied Sara on stage, however, as some of them have already turned 16, there will be changes in backing team - dancers in Kiev will be Bisera Martinovska, Iva Popovska, Tanja Vasilevska, Teodora Jolakovska and Daniel Todorovski (who danced with Bobi Andonov last year). Emi will also travel to Kyiv to accompany Sara, as she did travel to Rotterdam. "I want to become a professional singer, and this is great foundation for my future career. It is sort of positive push and performance in the Kiev may bring me to the spotlight. I have been twice in Ukraine and now I am looking forward to visit this country once again, but now I am coming with a huge responsibility - to represent Macedonia at the Junior Eurosong Contest. I'll do my best and I hope the audience at home and throughout Europe will like my song and my performance, as well as my looks", Sara adds. "In Ukraine I expect to get friendship, fun, experience and, above all, a good ranking" Song will be performed in Macedonian language, but in order to promote it, recording of English version was considered as well. "I will sing a song in the universal language of love which all will understand". - I'm really committed to reach the desired result. On the desk in my room I have a huge weekly schedule of activities that I must do in order to prepare for the contest, says Sara. 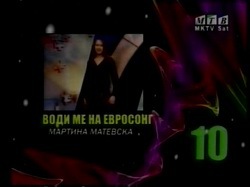 Macedonian television crew will travel to Kiev on November 14. 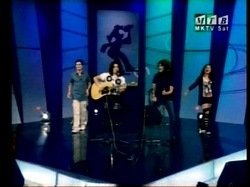 Only minor changes were made in the song compared to the national final, but choreography was changed significantly. 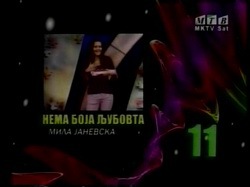 Dime Dimitrovski will be Macedonian commentator of the show, while results of the national vote will be delivered by Jovana Krstevska, who took part in the national preselection this year. РЎР°СЂР° РњР°СЂРєРѕРІСЃРєР° СЂРѕРґРёР»Р°СЃСЊ 27РіРѕ РёСЋРЅСЏ 1995 РіРѕРґР°. РћРЅР° Р¶РёРІРµС‚ РІ РЎРєРѕРїСЊРµ Рё СѓС‡РёС‚СЃСЏ РІ 8Рј РєР»Р°СЃСЃРµ С€РєРѕР»С‹ "РЇРЅ РђРјРѕСЃ РљРѕРјРµРЅСЃРєРё", РѕРЅР° РѕС‚Р»РёС‡РЅРёС†Р°. РљРѕРіРґР° Р±С‹Р»Р° РїРѕСЃС‚СЂРѕРµРЅР° РЅРѕРІР°СЏ С€РєРѕР»Р°, РЎР°СЂРµ РґРѕСЃС‚Р°Р»Р°СЃСЊ С‡РµСЃС‚СЊ РёСЃРїРѕР»РЅРµРЅРёСЏ С€РєРѕР»СЊРЅРѕРіРѕ РіРёРјРЅР°. Р‘РѕР»СЊС€Рµ РІСЃРµРіРѕ РІ Р¶РёР·РЅРё РЎР°СЂР° Р»СЋР±РёС‚ РїРµС‚СЊ Рё С‚Р°РЅС†РµРІР°С‚СЊ. Р’ СЌС‚РѕРј РіРѕРґСѓ РѕРЅР° Р·Р°РєРѕРЅС‡РёР»Р° РјСѓР·С‹РєР°Р»СЊРЅСѓСЋ С€РєРѕР»Сѓ "Р�Р»СЊСЏ РќРёРєРѕР»РѕРІСЃРєРё Р›СѓРё". Р•Рµ РїСЂРµРїРѕРґР°РІР°С‚РµР»СЊ СЃРѕР»СЊС„РµРґР¶РёРѕ РђРЅР° РљРѕСЃС‚РѕРІР°, Р° С„РѕСЂС‚РµРїРёР°РЅРѕ - РњР°СЏ РџРѕРїРѕРІРёС‡. РџРѕСЃР»РµРґРЅРёРµ РїРѕР»С‚РѕСЂР° РіРѕРґР° РѕРЅР° Р±РµСЂРµС‚ С‡Р°СЃС‚РЅС‹Рµ СѓСЂРѕРєРё РІРѕРєР°Р»Р° Сѓ РїСЂРѕС„РµСЃСЃРѕСЂР° Р’Р»Р°РґРѕ РЎСЂР±РёРЅРѕРІСЃРєРё. "РњСѓР·С‹РєР° - СЌС‚Рѕ РјРѕСЏ СЃР°РјР°СЏ Р±РѕР»СЊС€Р°СЏ Р»СЋР±РѕРІСЊ. РЇ СѓРІРµСЂРµРЅР°, С‡С‚Рѕ РєРѕРіРґР° РІС‹СЂР°СЃС‚Сѓ - СЏ СЃС‚Р°РЅСѓ РёР·РІРµСЃС‚РЅРѕР№ РїРµРІРёС†РµР№ РІ РњР°РєРµРґРѕРЅРёРё Рё РЅР° Р‘Р°Р»РєР°РЅР°С…. РЇ РѕР±РѕР¶Р°СЋ РёСЃРєСѓСЃСЃС‚РІРѕ, РїРµРЅРёРµ Рё С‚Р°РЅС†С‹", РіРѕРІРѕСЂРёС‚ РЎР°СЂР°. РЎ 5 Р»РµС‚ РЎР°СЂР° С‚Р°РєР¶Рµ Р±РµСЂРµС‚ СѓСЂРѕРєРё С‚Р°РЅС†Р° Рё 6 Р»РµС‚ Р·Р°РЅРёРјР°Р»Р°СЃСЊ РІ РјСѓР·С‹РєР°Р»СЊРЅРѕРј РєРѕР»Р»РµРґР¶Рµ. РћРЅР° РІС…РѕРґРёР»Р° РІРѕ РјРЅРѕР¶РµСЃС‚РІРѕ Р±Р°Р»РµС‚РЅС‹С… РіСЂСѓРїРї, С‚Р°РєРёС… РєР°Рє "РњР°Рє РњРѕРґРµР»СЃ" Рё "Р РµР±РёСЃ". РЈР¶Рµ 6 РіРѕРґР° РѕРЅР° С‚Р°РЅС†СѓРµС‚ РІ С…РёРї-С…РѕРї Рё РґР¶Р°Р· С‚Р°РЅС†РµРІР°Р»СЊРЅРѕР№ РіСЂСѓРїРїРµ "Р­РІСЂРёРєР°", С…РѕСЂРµРѕРіСЂР°С„ - РљР°С‚РµСЂРёРЅР° Р™РѕР»Р°РєРѕРІСЃРєР°. РљР°Рє РїРµРІРёС†Р°, РЎР°СЂР° РїСЂРёРЅРёРјР°Р»Р° СѓС‡Р°СЃС‚РёРµ РІРѕ РјРЅРѕР¶РµСЃС‚РІРµ С„РµСЃС‚РёРІР°Р»РµР№. РќР° С„РµСЃС‚РёРІР°Р»Рµ "Р—РІРµР·РґРёС‡РєРё" РІ РџСЂРёР»РµРїРµ, РњР°РєРµРґРѕРЅРёСЏ РѕРЅР° РІС‹СЃС‚СѓРїР°Р»Р° РІ 2006 (3Рµ РјРµСЃС‚Рѕ СЃ РїРµСЃРЅРµР№ "РЎР°РјР° РЅРёР· РЎР°С…Р°СЂР°" (РћРґРЅР° С‡РµСЂРµР· РЎР°С…Р°СЂСѓ)), РІ 2007 (2Рµ РјРµСЃС‚Рѕ СЃ РїРµСЃРЅРµР№ "Р—РІРµР·РґРёС‚Рµ РЅРµ Р»Р°Р·Р°С‚") Рё РІ 2008 (3Рµ РјРµСЃС‚Рѕ СЃ "РўРёРµ РѕС‡Рё СЃРёРЅРё РіРґРµ" (Р“РґРµ С‚Рµ СЃРёРЅРёРµ РіР»Р°Р·Р°)). 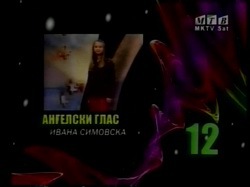 РЈС‡Р°СЃС‚РЅРёС†Р° С„РµСЃС‚РёРІР°Р»РµР№ "РњСѓР·РёС‡РЅР° РїР°СЂР°СЃРѕР»СЊРєР° 2007" (РњСѓР·С‹РєР°Р»СЊРЅС‹Р№ Р·РѕРЅС‚РёРє") РІ Р’РёРЅРЅРёС†Рµ, РЈРєСЂР°РёРЅР° (2Рµ РјРµСЃС‚Рѕ), Рё С„РµСЃС‚РёРІР°Р»СЏ РІ РњР°СЂРёСѓРїРѕР»Рµ, РЈРєСЂР°РёРЅР° "РњР°РёР±СѓС‚РЅРµ РєСЂР°РёРЅРё" РІ 2008 РіРѕРґСѓ (2Рµ РјРµСЃС‚Рѕ). РћРЅР° С‚Р°РєР¶Рµ РїСЂРёРЅСЏР»Р° СѓС‡Р°СЃС‚РёРµ РІ РєРѕРЅРєСѓСЂСЃРµ "РџСЂРѕР»РµС‚РЅРё Р·РІРѕРЅС‡РёРЅР°" РІ РЁС‚СЂСѓРјРёС†Рµ, РњР°РєРµРґРѕРЅРёСЏ, РІ 2008 РіРѕРґСѓ Р·Р°РІРѕРµРІР°Р»Р° 3Рµ РјРµСЃС‚Рѕ РЅР° "РњР°Р»Рµ РЎРєР°Р»Рµ" РІ РҐРµСЂС†РµРі РќРѕРІРё, Р§РµСЂРЅРѕРіРѕСЂРёСЏ, РёСЃРїРѕР»РЅРёРІ РїРµСЃРЅСЋ "Р›СЋР±РѕРІСЊ Рё РјСѓР·С‹РєР°", Р° РІ 2009 РµС‰Рµ РѕРґРЅРѕ 3Рµ РјРµСЃС‚Рѕ РЅР° С„РµСЃС‚РёРІР°Р»Рµ "РЎРѕР»РЅС†Рµ, Р Р°РґРѕСЃС‚СЊ Рё РљСЂР°СЃРѕС‚Р°" РІ РќРµСЃcРµР±Р°СЂРµ, Р‘РѕР»РіР°СЂРёСЏ СЃ РїРµСЃРЅРµР№ "Р’СЂРµРјРµС‚Рѕ С‡Рµ РЅРё РєР°Р¶Рµ" Р›Р°Р·Р°СЂР° Р¦РІРµС‚РєРѕРІСЃРєРё. РћРЅР° С‚Р°РєР¶Рµ РїРѕР»СѓС‡РёР»Р° РїРµСЂРІС‹Р№ РїСЂРёР· Р·Р° СЃС†РµРЅРёС‡РµСЃРєРѕРµ РІС‹СЃС‚СѓРїР»РµРЅРёРµ РЅР° РјРѕР»РѕРґРµР¶РЅРѕРј С„РµСЃС‚РёРІР°Р»Рµ "РЎСѓРїРµСЂР·РІРµР·РґР°" СЃ РїРµСЃРЅРµР№ "РЎРёРіРЅР°Р»Рё РЅР° Р»СЊСѓР±РѕРІС‚Р°". Р’ 2007 РіРѕРґСѓ РЎР°СЂР° РїСЂРёРЅРёРјР°Р»Р° СѓС‡Р°СЃС‚РёРµ РІ РЅР°С†РёРѕРЅР°Р»СЊРЅРѕРј РѕС‚Р±РѕСЂРµ РЅР° Р”РµС‚СЃРєРѕРµ Р•РІСЂРѕРІРёРґРµРЅРёРµ СЃ РїРµСЃРЅРµР№ "Mislish na mene" (РўС‹ РґСѓРјР°РµС€СЊ РѕР±Рѕ РјРЅРµ) Рё Р·Р°РЅСЏР»Р° 2Рµ РјРµСЃС‚Рѕ. Р’ СЌС‚РѕРј Р¶Рµ РіРѕРґСѓ РѕРЅР° РІС‹СЃС‚СѓРїР°Р»Р° РІ РєР°С‡РµСЃС‚РІРµ Р±СЌРє-РІРѕРєР°Р»РёСЃС‚РєРё Сѓ Р РѕСЃРёС†С‹ Рё Р”РёРјРёС‚Р°СЂР° РЅР° Р•РІСЂРѕРІРёРґРµРЅРёРё РІ Р РѕС‚С‚РµСЂРґР°РјРµ. Р’ 2008 РіРѕРґСѓ РѕРЅР° РІС‹СЃС‚СѓРїРёР»Р° РІ РєР°С‡РµСЃС‚РІРµ РіРѕСЃС‚СЊРё РѕС‚Р±РѕСЂР°, С‚Р°РєР¶Рµ РёСЃРїРѕР»РЅРёРІ "Р›СЋР±РѕРІСЊ Рё РјСѓР·С‹РєСѓ". Р’ СЃРІРѕР±РѕРґРЅРѕРµ РІСЂРµРјСЏ, РїРѕРјРёРјРѕ С‚Р°РЅС†РµРІ Рё РїРµРЅРёСЏ, РѕРЅР° С…РѕРґРёС‚ РЅР° СѓСЂРѕРєРё Р°РЅРіР»РёР№СЃРєРѕРіРѕ РІ С€РєРѕР»Сѓ РќРћР’Рђ. "РџРѕРјРёРјРѕ РјСѓР·С‹РєРё РјРЅРµ РЅСЂР°РІСЏС‚СЃСЏ РёРЅРѕСЃС‚СЂР°РЅРЅС‹Рµ СЏР·С‹РєРё, РјР°С‚РµРјР°С‚РёРєР°, СЏ С‚Р°РєР¶Рµ РїСЂРёРЅРёРјР°Р»Р° СѓС‡Р°СЃС‚РёРµ РІ РІС‹СЃС‚Р°РІРєРµ РґРµС‚СЃРєРѕРіРѕ РёСЃРєСѓСЃСЃС‚РІР° Рё РїСЂРѕС€Р»Р° РєСѓСЂСЃ РјР°РЅРµРєРµРЅС‰РёС†С‹ СЃ СЃС‚СѓРґРёРё Р¦СЂРЅРѕРєСЂР°Рє, Рё Р±С‹Р»Р° РІС‹Р±СЂР°РЅР° Р»РёС†РѕРј РіР°Р·РµС‚С‹ "РќР°С€ СЃРІРµС‚". РћРЅР° С‚Р°РєР¶Рµ Р»СЋР±РёС‚ РїСЂРѕРІРѕРґРёС‚СЊ РІСЂРµРјСЏ СЃ РґСЂСѓР·СЊСЏРјРё, РєР°С‚Р°С‚СЊСЃСЏ РЅР° РІРµР»РѕСЃРёРїРµРґРµ Рё СЂРѕР»РёРєРѕРІС‹С… РєРѕРЅСЊРєР°С…. РЎР°СЂРµ РЅСЂР°РІРёС‚СЃСЏ СЃР»СѓС€Р°С‚СЊ РїРѕРї-РјСѓР·С‹РєСѓ Рё RnB. Р•Рµ Р»СЋР±РёРјС‹Рµ РјР°РєРµРґРѕРЅСЃРєРёРµ РїРµРІС†С‹: РўРѕС€Рµ РџСЂРѕРµСЃРєРё, "Next Time", РўР°РјР°СЂР° РўРѕРґРµРІСЃРєР°, Р›Р°РјР±Рµ РђР»Р°Р±Р°РєРѕРІСЃРєРё, Р° РёР· Р·Р°РіСЂР°РЅРёС‡РЅС‹С… РµР№ РЅСЂР°РІСЏС‚СЃСЏ Р‘РµР№РѕРЅСЃРµ, РЎРµР»РёРЅ Р”РёРѕРЅ, РљСЂРёСЃ Р‘СЂР°СѓРЅ РЎР°СЂР° Р»СЋР±Р»СЋ РєР°С‚Р°С‚СЊСЃСЏ РЅР° СЂРѕР»РёРєРѕРІС‹С… РєРѕРЅСЊРєР°С… Рё РѕС‚РґС‹С…Р°С‚СЊ СЃ РґСЂСѓР·СЊСЏРјРё. Р•Рµ РјРµС‡С‚Р° - РїРѕР±С‹РІР°С‚СЊ РІ СЂР°Р·РЅС‹С… СЃС‚СЂР°РЅР°С…. "РњС‹ РїРѕР»СѓС‡РёР»Рё РѕС‚Р»РёС‡РЅСѓСЋ РїРµСЃРЅСЋ - РїРѕР±РµРґРёС‚РµР»СЊРЅРёС†Сѓ, РЅР°Рґ РєРѕС‚РѕСЂРѕР№ РІ С‚РµС‡РµРЅРёРё РґРІСѓС… Р±Р»РёР¶Р°Р№С€РёС… РЅРµРґРµР»СЊ РјС‹ РїРѕСЂР°Р±РѕС‚Р°РµРј Рё РѕС„РёС†РёР°Р»СЊРЅРѕ Р·Р°СЏРІРёРј РµРµ РІ РљРёРµРІРµ. РџРѕРЅР°РґРѕР±РёС‚СЊСЃСЏ РЅРµРјРЅРѕРіРѕ РїРѕСЂР°Р±РѕС‚Р°С‚СЊ Рё РЅР°Рґ СЃС†РµРЅРёС‡РµСЃРєРёРј РІС‹СЃС‚СѓРїР»РµРЅРёРµРј, С‡С‚РѕР±С‹ РіР°СЂР°РЅС‚РёСЂРѕРІР°С‚СЊ, С‡С‚Рѕ РЅР°С€Р° СЃС‚СЂР°РЅР° Р±СѓРґРµС‚ РїСЂРµРґСЃС‚Р°РІР»РµРЅР° РІ СЃР°РјРѕРј Р»СѓС‡С€РµРј СЃРІРµС‚Рµ. РЎР°СЂР° РіРѕС‚РѕРІР° Рє СЂР°Р±РѕС‚Рµ Рё РјС‹ РЅР°РґРµРµРјСЃСЏ, С‡С‚Рѕ РІСЃРµ Р±СѓРґРµС‚ С…РѕСЂРѕС€Рѕ", СЃРєР°Р·Р°Р» Р Р°РґРµ РЎРїР°СЃРѕРІСЃРєРё, РіР»Р°РІР° РґРµР»РµРіР°С†РёРё. "РњС‹ РЅР°РґРµРµРјСЃСЏ РЅР° СѓСЃРїРµС€РЅРѕРµ РІС‹СЃС‚СѓРїР»РµРЅРёРµ РІ РљРёРµРІРµ. Р’ РїСЂРѕС€Р»РѕРј РіРѕРґСѓ РЅР°С€ СѓС‡Р°СЃС‚РЅРёРє Р‘РѕР±Р±Рё РђРЅРґРѕРЅРѕРІ СЃС‚Р°Р» РїСЏС‚С‹Рј, Р° С‚РµРїРµСЂСЊ РјС‹ Р¶РµР»Р°РµРј РЎР°СЂРµ РїРѕР±РµРґС‹ РІ РљРёРµРІРµ", СЃРєР°Р·Р°Р» Р›СЊСЋРїС‡Рѕ РњРёСЂРєРѕРІСЃРєРё, Р°СЂС‚-РґРёСЂРµРєС‚РѕСЂ РЅР°С†РёРѕРЅР°Р»СЊРЅРѕРіРѕ РѕС‚Р±РѕСЂР°. "РќРёРєР°РєРёРјРё СЃР»РѕРІР°РјРё РЅРµР»СЊР·СЏ РѕРїРёСЃР°С‚СЊ, С‡С‚Рѕ СЏ СЃРµР№С‡Р°СЃ С‡СѓРІСЃС‚РІСѓСЋ. РҐРѕС‚СЏ СЏ Рё РЅР°РґРµСЏР»Р°СЃСЊ РЅР° РїРѕР±РµРґСѓ, Рё РјРЅРѕРіРѕ СЂР°Р±РѕС‚Р°Р»Р° РґР»СЏ СЌС‚РѕРіРѕ, СЃРµР№С‡Р°СЃ СЏ РѕС‡РµРЅСЊ СЂР°РґР° Рё СЃС‡Р°СЃС‚Р»РёРІР°. РњРЅРµ С…РѕС‚РµР»РѕСЃСЊ Р±С‹ РїРѕР±Р»Р°РіРѕРґР°СЂРёС‚СЊ СЃРІРѕРµРіРѕ РїСЂРµРїРѕРґР°РІР°С‚РµР»СЏ РїРѕ РІРѕРєР°Р»Сѓ Р’Р»Р°РґРѕ РЎСЂР±РёРЅРѕРІСЃРєРё, РђР»РµРєСЃР°РЅРґР°СЂР° РњР°СЃРµРІСЃРєРё, РєРѕС‚РѕСЂС‹Р№ СЃРґРµР»Р°Р» Р°СЂР°РЅР¶РёСЂРѕРІРєСѓ РїРµСЃРЅРё, Рё, РєРѕРЅРµС‡РЅРѕ Р¶Рµ, РґРµРІРѕС‡РµРє РёР· РіСЂСѓРїРїС‹ "Eureka", РєРѕС‚РѕСЂС‹Рµ Р±С‹Р»Рё СЃРѕ РјРЅРѕР№ РЅР° СЃС†РµРЅРµ", РіРѕРІРѕСЂРёС‚ РѕР±СЂР°РґРѕРІР°РЅРЅР°СЏ РїРѕР±РµРґРёС‚РµР»СЊРЅРёС†Р°. РЎ РЎР°СЂРѕР№ РЅР° СЃС†РµРЅРµ РІС‹СЃС‚СѓРїРёР»Рё РµРµ СЃС‚Р°СЂС€Р°СЏ СЃРµСЃС‚СЂР° Р­РјРё РњР°СЂРєРѕРІСЃРєР° (РєРѕС‚РѕСЂР°СЏ С‚Р°РєР¶Рµ РїРѕРјРѕРіР»Р° РЎР°СЂРµ РЅР°РїРёСЃР°С‚СЊ С‚РµРєСЃС‚), Р‘РѕР№СЏРЅР° РќРёРє, Р™РѕРІР°РЅР° Р�РІР°РЅРѕРІСЃРєР° Рё Р‘РёСЃРµСЂР° РњР°СЂС‚РёРЅРѕРІСЃРєР°, РѕРґРЅР°РєРѕ, РїРѕСЃРєРѕР»СЊРєСѓ РЅРµРєРѕС‚РѕСЂС‹Рј РёР· РЅРёС… СѓР¶Рµ РёСЃРїРѕР»РЅРёР»РѕСЃСЊ 16 Р»РµС‚, РІ РєРѕРјР°РЅРґРµ Р±СЌРє-РІРѕРєР°Р»РёСЃС‚РѕРІ РїСЂРѕРёР·РѕР№РґСѓС‚ Р·Р°РјРµРЅС‹ - С‚Р°РЅС†РѕСЂР°РјРё РІ РљРёРµРІРµ СЃС‚Р°РЅСѓС‚ Р‘РёСЃРµСЂР° РњР°СЂС‚РёРЅРѕРІСЃРєР°, Р�РІР° РџРѕРїРѕРІСЃРєР°, РўР°РЅСЏ Р’Р°СЃРёР»РµРІСЃРєР°, РўРµРѕРґРѕСЂР° Р™РѕР»Р°РєРѕРІСЃРєР° Рё Р”Р°РЅРёРµР»СЊ РўРѕРґРѕСЂРѕРІСЃРєРё (С‚Р°РЅС†РѕСЂ Р‘РѕР±Рё РђРЅРґРѕРЅРѕРІР° РІ РїСЂРѕС€Р»РѕРј РіРѕРґСѓ). Р­РјРё РѕС‚РїСЂР°РІРёС‚СЃСЏ РІ РљРёРµРІ РєР°Рє СЃРѕРїСЂРѕРІРѕР¶РґР°СЋС‰РµРµ Р»РёС†Рѕ, С‚Р°РєР¶Рµ РєР°Рє РѕРЅР° РµР·РґРёР»Р° Рё РІ Р РѕС‚С‚РµСЂРґР°Рј. "РЇ С…РѕС‡Сѓ СЃС‚Р°С‚СЊ РїСЂРѕС„РµСЃСЃРёРѕРЅР°Р»СЊРЅРѕР№ РїРµРІРёС†РµР№, Рё СЌС‚Рѕ - С…РѕСЂРѕС€Р°СЏ РѕСЃРЅРѕРІР° РґР»СЏ РјРѕРµР№ Р±СѓРґСѓС‰РµР№ РєР°СЂСЊРµСЂС‹. Р­С‚Рѕ РѕРїСЂРµРґРµР»РµРЅРЅС‹Р№ РїРѕР·РёС‚РёРІРЅС‹Р№ С‚РѕР»С‡РѕРє, Рё РІС‹СЃС‚СѓРїР»РµРЅРёРµ РІ РљРёРµРІРµ РјРѕР¶РµС‚ РїСЂРёРІР»РµС‡СЊ РёРЅС‚РµСЂРµСЃ РєРѕ РјРЅРµ. РЇ СѓР¶Рµ РґРІР°Р¶РґС‹ Р±С‹Р»Р° РІ РЈРєСЂР°РёРЅРµ Рё СЃ РЅРµС‚РµСЂРїРµРЅРёРµРј Р¶РґСѓ РІРѕР·РјРѕР¶РЅРѕСЃС‚Рё РІРµСЂРЅСѓС‚СЊСЃСЏ С‚СѓРґР°, РЅРѕ РЅР° СЌС‚РѕС‚ СЂР°Р· СЃ Р±РѕР»СЊС€РµР№ РѕС‚РІРµС‚СЃС‚РІРµРЅРЅРѕСЃС‚СЊСЋ - СЏ Р±СѓРґСѓ РїСЂРµРґСЃС‚Р°РІР»СЏС‚СЊ СЃРІРѕСЋ СЃС‚СЂР°РЅСѓ. РЇ РїРѕСЃС‚Р°СЂР°СЋСЃСЊ РїРѕРєР°Р·Р°С‚СЊ РІСЃРµ, РЅР° С‡С‚Рѕ СЏ СЃРїРѕСЃРѕР±РЅР°, Рё РЅР°РґРµСЋСЃСЊ Р·СЂРёС‚РµР»СЏРј РІ РјРѕРµР№ СЃС‚СЂР°РЅРµ Рё РїРѕ РІСЃРµР№ Р•РІСЂРѕРїРµ РїРѕРЅСЂР°РІРёС‚СЃСЏ РјРѕСЏ РїРµСЃРЅСЏ, РјРѕР№ РІРЅРµС€РЅРёР№ РІРёРґ Рё РјРѕРµ РІС‹СЃС‚СѓРїР»РµРЅРёРµ", РґРѕР±Р°РІР»СЏРµС‚ РЎР°СЂР°. "РќР° РЈРєСЂР°РёРЅРµ СЏ РѕР¶РёРґР°СЋ РЅР°Р№С‚Рё РЅРѕРІС‹С… РґСЂСѓР·РµР№, РїРѕР»СѓС‡РёС‚СЊ СѓРґРѕРІРѕР»СЊСЃС‚РІРёРµ Рё РЅРѕРІС‹Р№ РѕРїС‹С‚, РЅРѕ РїСЂРµР¶РґРµ РІСЃРµРіРѕ Р·Р°РЅСЏС‚СЊ С…РѕСЂРѕС€РµРµ РјРµСЃС‚Рѕ". РќР° РєРѕРЅРєСѓСЂСЃРµ РїРµСЃРЅСЏ Р±СѓРґРµС‚ РёСЃРїРѕР»РЅРµРЅР° РЅР° РјР°РєРµРґРѕРЅСЃРєРѕРј, РЅРѕ РІ РїСЂРѕРјРѕ-С†РµР»СЏС… СЂР°СЃСЃРјР°С‚СЂРёРІР°Р»Р°СЃСЊ РІРѕР·РјРѕР¶РЅРѕСЃС‚СЊ Р·Р°РїРёСЃРё Рё Р°РЅРіР»РёР№СЃРєРѕР№ РІРµСЂСЃРёРё РєРѕРјРїРѕР·РёС†РёРё. "РЇ Р±СѓРґСѓ РїРµС‚СЊ РЅР° СѓРЅРёРІРµСЂСЃР°Р»СЊРЅРѕРј СЏР·С‹РєРµ Р»СЋР±РІРё, РєРѕС‚РѕСЂС‹Р№ РїРѕР№РјСѓС‚ РІСЃРµ". - РЇ СЃРµСЂСЊРµР·РЅРѕ РЅР°С†РµР»РµРЅР° РЅР° РґРѕСЃС‚РёР¶РµРЅРёРµ СЂРµР·СѓР»СЊС‚Р°С‚Р°. Р’ РјРѕРµР№ РєРѕРјРЅР°С‚Рµ РІРёСЃРёС‚ РѕРіСЂРѕРјРЅРѕРµ РµР¶РµРЅРµРґРµР»СЊРЅРѕРµ СЂР°СЃРїРёСЃР°РЅРёРµ С‚РѕРіРѕ, С‡С‚Рѕ РјРЅРµ РЅР°РґРѕ СЃРґРµР»Р°С‚СЊ, С‡С‚РѕР±С‹ РїРѕРґРіРѕС‚РѕРІРёС‚СЊСЃСЏ Рє РєРѕРЅРєСѓСЂСЃСѓ, РіРѕРІРѕСЂРёС‚ РЎР°СЂР°. Р”РµР»РµРіР°С†РёСЏ РњР°РєРµРґРѕРЅРёРё РѕС‚РїСЂР°РІРёС‚СЃСЏ РІ РљРёРµРІ 14РіРѕ РЅРѕСЏР±СЂСЏ. Р’ СЃР°РјРѕР№ РїРµСЃРЅРµ РїРѕ СЃСЂР°РІРЅРµРЅРёСЋ СЃ РЅР°С†РёРѕРЅР°Р»СЊРЅС‹Рј РѕС‚Р±РѕСЂРѕРј РїСЂРѕРёР·РѕС€Р»Рё С‚РѕР»СЊРєРѕ РјРёРЅРёРјР°Р»СЊРЅС‹Рµ РёР·РјРµРЅРµРЅРёСЏ, Р° РІРѕС‚ СЃС†РµРЅРёС‡РµСЃРєРёР№ РЅРѕРјРµСЂ РёР·РјРµРЅРёР»СЃСЏ Р·РЅР°С‡РёС‚РµР»СЊРЅРѕ. Р”РёРјРµ Р”РёРјРёС‚СЂРѕРІСЃРєРё СЃС‚Р°РЅРµС‚ РєРѕРјРјРµРЅС‚Р°С‚РѕСЂРѕРј РњР°РєРµРґРѕРЅРёРё РЅР° РєРѕРЅРєСѓСЂСЃРµ, Р° СЂРµР·СѓР»СЊС‚Р°С‚С‹ РіРѕР»РѕСЃРѕРІР°РЅРёСЏ РѕР±СЉСЏРІРёС‚ Р™РѕРІР°РЅР° РљСЂСЃС‚РµРІСЃРєР°, СѓС‡Р°СЃС‚РЅРёС†Р° РЅР°С†РёРѕРЅР°Р»СЊРЅРѕРіРѕ РѕС‚Р±РѕСЂР° СЌС‚РѕРіРѕ РіРѕРґР°. СЃРѕРЅ СЃРё СЃРѕРЅСѓРІР°Рј Р·Р° С™СѓР±РѕРІС‚Р°. son si sonuvam za ljubovta. 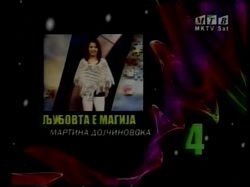 - Hello, Sara, and the first of all our congratulations for winning Macedonian national selection! What were your first thoughts when you realized you are the winner of the competition? - I was very happy and excited when I won. I wished for that deep in my heart, and my wish came true. I sent my thanks to all those, who voted for me, who believed in me, and who supported me. Most of all to my parents, whose complete support keeps me going on. - I am a persistent, kind, and friendly young person, with a big heart and clean soul. - My inspiration is love in every form. This time, I met a boy at a party, And I liked him very muchвЂ¦.he made me feel those butterflies in my stomach for the first time in my life, and that was my inspiration to write the text, and to create the basic melody later on. - Who are your vocal coach and choreographer of your entry? 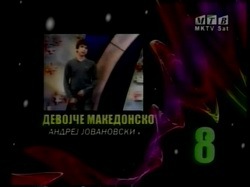 - Vlado Srbinovski is my singing teacher, and Katerina Jolakovska is my choreographer. My greetings to them! - Can you also introduce the dancers, who accompanied you on stage? - There will be 5 dancers with me on stage: Bisera, Teodora, Tanja, Iva are members of the Ballet Studio вЂњEurekaвЂќ, where I am a member as well, and Daniel is a member of the Dance Club вЂњRitam plusвЂќ. - How will you visually present your entry on stage? Will it be similar performance as during Macedonian national final, or is there plan to add visual effects for the international audience to understand better your song? - The entire performance in Kyiv will not be the same as that in Macedonia. We are preparing a new stage appearance, with more effects, which I wonвЂ™t disclose. IвЂ™ll let the audience enjoy the entire story of my song on November 21st. I do hope they will like it. - Well, it is a bit hard until you get used to it, but then, when you love doing something it is not hard to doвЂ¦ and I do it all with love! - My favourite subjects are Math, English, Macedonian, and, of course, Music. Actually, I like all subjectsвЂ¦I just love learning and going to school. - You have been at Junior Eurovision at Rotterdam, what are your memories from it? 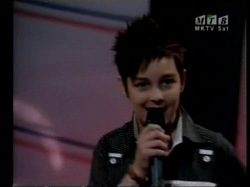 - I had the most beautiful days of my life at the Junior Eurovision Contest in Rotterdam. It was hanging out, meeting people and partying all day longвЂ¦ That was actually what encouraged me to enter this contest. I am sooooo happy to participate once more, and to feel that excitement on stage. - Have you received any advice from the previous Macedonian JESC entrants? - I have certainly received advice from the last yearвЂ™s JESC participants. I talked to Bobi Andonov, Dimitar and Rosica. Although I have personal Eurovision experience, I accept all suggestions from those who want to help me do my best in Kyiv. - Do you have some favourite entries from the past year of the competition? - Last year, apart from Bobi, as our representative, my favourite song was the Georgian song вЂ“ Bzikebi. - Of course I want to know who the other participants are. I visit the ESCKaz page every day, to find out all the news. I have learnt there that I am performing 13th, so, from now on, 13 is my lucky number. - What is your aim for the contest? Are you going to win it or simply have good time and make new friends? - I want to communicate, meet new friends, but, to be completely honest, I want to win the Junior Eurovision Contest. - Do you like contests and to compete in general? - I like to compete, and I love to sing and to be on stage. 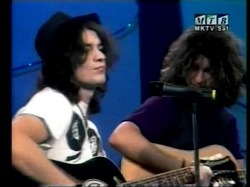 - Are you performing many original songs, what is your regular repertoire is made of? - I have 7 songs, which I perform at various shows, humanitarian concerts, etcвЂ¦ But occasionally I sing songs of famous domestic or foreign stars as well. - What music do you typical like listening to? What are your favourite local and international singers? 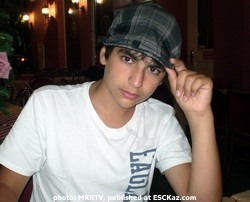 - I am an 8-grader, and I plan on continuing my education at a musical high school, at home in Macedonia, or abroad. 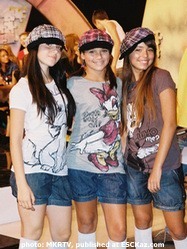 In the future I see myself as a professional singer with my own styleвЂ¦ which will be remembered many years to come. - And, finally, if you have anything to add to the readers you can do it now. - Watch the Junior Eurovision song in Kyiv. The young artists will offer you another unique pleasure. Regards from Sara Markoska, from Macedonia. With my song вЂњFor LoveвЂќ, I will try to win the hearts of the entire European audience. Bye! - Thanks for the interview and see you in Kyiv! - РџСЂРёРІРµС‚, РЎР°СЂР°! РќР°С€Рё РїРѕР·РґСЂР°РІР»РµРЅРёСЏ СЃ РїРѕР±РµРґРѕР№ РЅР° РњР°РєРµРґРѕРЅСЃРєРѕРј РѕС‚Р±РѕСЂРµ! РљР°РєР°СЏ Р±С‹Р»Р° С‚РІРѕСЏ РїРµСЂРІР°СЏ РјС‹СЃР»СЊ, РєРѕРіРґР° С‚С‹ РїРѕРЅСЏР»Р°, С‡С‚Рѕ РїРѕР±РµРґРёР»Р° РЅР° СЌС‚РѕРј РєРѕРЅРєСѓСЂСЃРµ? - РЇ Р±С‹Р»Р° РѕС‡РµРЅСЊ СЂР°РґР° СЃРІРѕРµР№ РїРѕР±РµРґРµ. РЇ РѕС‡РµРЅСЊ СЃРёР»СЊРЅРѕ Р¶РµР»Р°Р»Р° РµРµ СЃРІРѕРёРј СЃРµСЂРґС†РµРј, Рё РјРѕСЏ РјРµС‡С‚Р° СЃР±С‹Р»Р°СЃСЊ. РЇ РїРѕР±Р»Р°РіРѕРґР°СЂРёР»Р° РІСЃРµС… С‚РµС…, РєС‚Рѕ РіРѕР»РѕСЃРѕРІР°Р» Р·Р° РјРµРЅСЏ, РєС‚Рѕ РІРµСЂРёР» РІ РјРµРЅСЏ Рё РїРѕРґРґРµСЂР¶РёРІР°Р». РџСЂРµР¶РґРµ РІСЃРµРіРѕ - СЌС‚Рѕ РјРѕРё СЂРѕРґРёС‚РµР»Рё, С‡СЊСЏ РІСЃРµСЃС‚РѕСЂРѕРЅРЅСЏСЏ РїРѕРґРґРµСЂР¶РєР° РґР°РµС‚ РјРЅРµ СЃРёР»С‹ РґР»СЏ РїСЂРѕРґРѕР»Р¶РµРЅРёСЏ СЂР°Р±РѕС‚С‹. - РЇ РЅР°СЃС‚РѕР№С‡РёРІР°СЏ, РґРѕР±СЂР°СЏ Рё РґСЂСѓР¶РµР»СЋР±РЅР°СЏ РґРµРІСѓС€РєР°, СЃ Р±РѕР»СЊС€РёРј СЃРµСЂРґС†РµРј Рё С‡РёСЃС‚РѕР№ РґСѓС€РѕР№. - Р’РґРѕС…РЅРѕРІРµРЅРёРµРј Рє РЅРµР№ РїРѕСЃР»СѓР¶РёР»Р° Р»СЋР±РѕРІСЊ РІРѕ РІСЃРµС… РµРµ С„РѕСЂРјР°С…. РќР° СЌС‚РѕС‚ СЂР°Р· СЏ РїРѕР·РЅР°РєРѕРјРёР»Р°СЃСЊ СЃ РѕРґРЅРёРј РїР°СЂРЅРµРј РЅР° РІРµС‡РµСЂРёРЅРєРµ Рё РѕРЅ РјРЅРµ РѕС‡РµРЅСЊ РїРѕРЅСЂР°РІРёР»СЃСЏ... РІРїРµСЂРІС‹Рµ РІ РјРѕРµР№ Р¶РёР·РЅРё СЏ РїРѕС‡СѓРІСЃС‚РІРѕРІР°Р»Р° РјСѓСЂР°С€РєРё РІРЅСѓС‚СЂРё СЃРµР±СЏ, Рё СЌС‚Рѕ СЃС‚Р°Р»Рѕ РѕСЃРЅРѕРІРѕР№ РґР»СЏ РЅР°РїРёСЃР°РЅРёСЏ С‚РµРєСЃС‚Р°, РЅР° РєРѕС‚РѕСЂСѓСЋ РїРѕС‚РѕРј СЏ РЅР°РїРёСЃР°Р»Р° РѕСЃРЅРѕРІРЅСѓСЋ РјРµР»РѕРґРёСЋ. - РљС‚Рѕ СЂР°Р±РѕС‚Р°РµС‚ СЃ С‚РѕР±РѕР№ РІ РєР°С‡РµСЃС‚РІРµ РїСЂРµРїРѕРґР°РІР°С‚РµР»СЏ РїРѕ РІРѕРєР°Р»Сѓ Рё С…РѕСЂРµРѕРіСЂР°С„Р°? - Р’Р»Р°РґРѕ РЎСЂР±РёРЅРѕРІСЃРєРё - РјРѕР№ СѓС‡РёС‚РµР»СЊ РїРµРЅРёСЏ Рё РљР°С‚РµСЂРёРЅР° Р™РѕР»Р°РєРѕРІСЃРєР° - РјРѕР№ С…РѕСЂРµРѕРіСЂР°С„. РџРµСЂРµРґР°СЋ РёРј РїСЂРёРІРµС‚! - РџСЂРµРґСЃС‚Р°РІСЊ РЅР°Рј, РїРѕР¶Р°Р»СѓР№СЃС‚Р°, С‚РІРѕРёС… РґСЂСѓР·РµР№, РєРѕС‚РѕСЂС‹Рµ РІС‹СЃС‚СѓРїСЏС‚ СЃ С‚РѕР±РѕР№ РЅР° СЃС†РµРЅРµ РІ РєР°С‡РµСЃС‚РІРµ РїРѕРґС‚Р°РЅС†РѕРІРєРё? - РЎРѕ РјРЅРѕР№ РЅР° СЃС†РµРЅРµ РІС‹СЃС‚СѓРїСЏС‚ РїСЏС‚СЊ С‚Р°РЅС†РѕСЂРѕРІ: Р‘РёСЃРµСЂР°, РўРµРѕРґРѕСЂР°, РўР°РЅСЏ, Р�РІР° - РѕРЅРё СѓС‡Р°СЃС‚РЅРёС†С‹ Р±Р°Р»РµС‚РЅРѕР№ СЃС‚СѓРґРёРё "Eureka" РІ РєРѕС‚РѕСЂРѕР№ СЏ С‚Р°РєР¶Рµ Р·Р°РЅРёРјР°СЋСЃСЊ, Рё Р”Р°РЅРёРµР»СЊ - РѕРЅ С‡Р»РµРЅ С‚Р°РЅС†РµРІР°Р»СЊРЅРѕРіРѕ РєР»СѓР±Р° "Ritam plus". - РљР°Рє С‚С‹ РІРёР·СѓР°Р»СЊРЅРѕ РїСЂРµРґСЃС‚Р°РІРёС€СЊ СЃРІРѕСЋ РїРµСЃРЅСЋ РЅР° СЃС†РµРЅРµ? РљР°РєРёРµ Р±СѓРґСѓС‚ РёР·РјРµРЅРµРЅРёСЏ РїРѕ СЃСЂР°РІРЅРµРЅРёСЋ СЃ РЅР°С†РёРѕРЅР°Р»СЊРЅС‹Рј РєРѕРЅРєСѓСЂСЃРѕРј? - Р’С‹СЃС‚СѓРїР»РµРЅРёРµ РїРѕР»РЅРѕСЃС‚СЊСЋ РёР·РјРµРЅРёС‚СЃСЏ. РњС‹ РіРѕС‚РѕРІРёРј РЅРѕРІС‹Р№ РёРјРёРґР¶, Р±СѓРґСѓС‚ РЅРѕРІС‹Рµ СЌС„С„РµРєС‚С‹ Рѕ РєРѕС‚РѕСЂС‹С… СЏ РїРѕРєР° РЅРµ СЂР°СЃСЃРєР°Р¶Сѓ. РЇ РЅР°РґРµСЋСЃСЊ, С‡С‚Рѕ Р·СЂРёС‚РµР»СЏРј РїРѕРЅСЂР°РІРёС‚СЃСЏ РЅР°С€Рµ РІС‹СЃС‚СѓРїР»РµРЅРёРµ 21РіРѕ РЅРѕСЏР±СЂСЏ. - РљР°Рє С‚РµР±Рµ СѓРґР°РµС‚СЃСЏ СЃРѕРІРјРµС‰Р°С‚СЊ РїРѕРґРіРѕС‚РѕРІРєСѓ Рє Р•РІСЂРѕРІРёРґРµРЅРёСЋ Рё СѓС‡РµР±Сѓ? - Р”Р°, СЌС‚Рѕ РЅРµРјРЅРѕРіРѕ С‚СЏР¶РµР»Рѕ, РїРѕРєР° РЅРµ РїСЂРёРІС‹РєРЅРµС€СЊ, РЅРѕ РїРѕС‚РѕРј, РµСЃР»Рё С‚С‹ Р»СЋР±РёС€СЊ С‡РµРј-С‚Рѕ Р·Р°РЅРёРјР°С‚СЊСЃСЏ С‚Рѕ СЌС‚Рѕ СѓР¶Рµ РЅРµ С‚Р°Рє СЃР»РѕР¶РЅРѕ... Рё СЏ РґРµР»Р°СЋ СЌС‚Рѕ СЃРѕ РІСЃРµР№ Р»СЋР±РѕРІСЊСЋ! - РљР°РєРёРµ Сѓ С‚РµР±СЏ Р»СЋР±РёРјС‹Рµ РїСЂРµРґРјРµС‚С‹ РІ С€РєРѕР»Рµ? - РњРЅРµ РЅСЂР°РІСЏС‚СЃСЏ РјР°С‚РµРјР°С‚РёРєР°, Р°РЅРіР»РёР№СЃРєРёР№, РјР°РєРµРґРѕРЅСЃРєРёР№, Рё, РєРѕРЅРµС‡РЅРѕ Р¶Рµ, РјСѓР·С‹РєР°. Р’РѕРѕР±С‰Рµ РјРЅРµ РЅСЂР°РІСЏС‚СЃСЏ РІСЃРµ РїСЂРµРґРјРµС‚С‹... СЏ РѕС‡РµРЅСЊ Р»СЋР±Р»СЋ СѓС‡РёС‚СЊСЃСЏ Рё С…РѕРґРёС‚СЊ РІ С€РєРѕР»Сѓ. - РўС‹ СѓР¶Рµ Р±С‹Р»Р° РЅР° Р”РµС‚СЃРєРѕРј Р•РІСЂРѕРІРёРґРµРЅРёРё РІ Р РѕС‚С‚РµСЂРґР°РјРµ, РєР°РєРёРµ Сѓ С‚РµР±СЏ РІРѕСЃРїРѕРјРёРЅР°РЅРёСЏ СЃ РЅРµРіРѕ? - Р­С‚Рѕ Р±С‹Р»Рё Р»СѓС‡С€РёРµ РґРЅРё РІ РјРѕРµР№ Р¶РёР·РЅРё. РњС‹ РІРµСЃРµР»РёР»РёСЃСЊ, РІСЃС‚СЂРµС‡Р°Р»РёСЃСЊ СЃ РЅРѕРІС‹РјРё Р»СЋРґСЊРјРё, РїСЂРѕРІРѕРґРёР»Рё РІСЂРµРјСЏ РЅР° РІРµС‡РµСЂРёРЅРєР°С…... РќР° СЃР°РјРѕРј РґРµР»Рµ - Р¶РµР»Р°РЅРёРµ РїРѕРІС‚РѕСЂРёС‚СЊ СЌС‚Рё РґРЅРё Рё РїРѕСЃР»СѓР¶РёР»Рѕ РґР»СЏ РјРµРЅСЏ С‚РѕР»С‡РєРѕРј РґР»СЏ СѓС‡Р°СЃС‚РёСЏ РІ СЌС‚РѕРј РіРѕРґСѓ. РЇ С‚Р°Р°Р°Рє СЂР°РґР°, С‡С‚Рѕ СЃРЅРѕРІР° РїСЂРёРјСѓ СѓС‡Р°СЃС‚РёРµ РІ Р”РµС‚СЃРєРѕРј Р•РІСЂРѕРІРёРґРµРЅРёРё Рё С‡С‚Рѕ СЃРјРѕРіСѓ СЃРЅРѕРІР° РѕС‰СѓС‚РёС‚СЊ РІСЃРµ СЌС‚Рё С‡СѓРІСЃС‚РІР° РѕС‚ РІС‹СЃС‚СѓРїР»РµРЅРёСЏ РЅР° РµРіРѕ СЃС†РµРЅРµ. - Р Р°Р·РіРѕРІР°СЂРёРІР°Р»Р° Р»Рё С‚С‹ СѓР¶Рµ СЃ РїСЂРѕС€Р»С‹РјРё РєРѕРЅРєСѓСЂСЃР°РЅС‚Р°РјРё Р•РІСЂРѕРІРёРґРµРЅРёСЏ, РїРѕР»СѓС‡РёР»Р° Р»Рё РѕС‚ РЅРёС… РєР°РєРёРµ-РЅРёР±СѓРґСЊ СЃРѕРІРµС‚С‹? - Р”Р°, СЏ СѓР¶Рµ СЂР°Р·РіРѕРІР°СЂРёРІР°Р»Р° СЃ Р‘РѕР±Рё РђРЅРґРѕРЅРѕРІС‹Рј, Р”РёРјРёС‚Р°СЂРѕРј Рё Р РѕСЃРёС†РµР№ Рё РѕРЅРё РґР°Р»Рё РјРЅРµ РЅРµРєРѕС‚РѕСЂС‹Рµ СЃРІРѕРё СЃРѕРІРµС‚С‹. РҐРѕС‚СЏ Сѓ РјРµРЅСЏ Р±С‹Р» Рё СЃРІРѕР№ РѕРїС‹С‚ СѓС‡Р°СЃС‚РёСЏ РІ Р•РІСЂРѕРІРёРґРµРЅРёРё СЏ СЃ СЂР°РґРѕСЃС‚СЊСЋ РїСЂРёРЅРёРјР°СЋ СЃРѕРІРµС‚С‹ С‚РµС…, РєС‚Рѕ С…РѕС‡РµС‚ РїРѕРјРѕС‡СЊ РјРѕРµРјСѓ РІС‹СЃС‚СѓРїР»РµРЅРёСЋ РІ РљРёРµРІРµ. - Р•СЃС‚СЊ Р»Рё Сѓ С‚РµР±СЏ РєР°РєРёРµ-С‚Рѕ СЃРѕР±СЃС‚РІРµРЅРЅС‹Рµ С„Р°РІРѕСЂРёС‚С‹ СЃ РїСЂРѕС€Р»С‹С… Р»РµС‚ РєРѕРЅРєСѓСЂСЃР°? - Р’ РїСЂРѕС€Р»РѕРј РіРѕРґСѓ, РїРѕРјРёРјРѕ Р‘РѕР±Рё, РЅР°С€РµРіРѕ РїСЂРµРґСЃС‚Р°РІРёС‚РµР»СЏ, РјРЅРµ РѕС‡РµРЅСЊ РїРѕРЅСЂР°РІРёР»Р°СЃСЊ РіСЂСѓР·РёРЅСЃРєР°СЏ РїРµСЃРЅСЏ Р‘Р·РёРєРµР±Рё. - РўРµР±Рµ РёРЅС‚РµСЂРµСЃРЅРѕ СѓР·РЅР°С‚СЊ, РєС‚Рѕ Р±СѓРґРµС‚ С‚РІРѕРёРјРё СЃРѕРїРµСЂРЅРёРєР°РјРё РІ РљРёРµРІРµ, С‚С‹ СЃР»СѓС€Р°РµС€СЊ РїРµСЃРЅРё РёР· РґСЂСѓРіРёС… СѓС‡Р°СЃС‚РІСѓСЋС‰РёС… СЃС‚СЂР°РЅ, СѓРґР°Р»РѕСЃСЊ Р»Рё СѓР¶Рµ РїРѕР·РЅР°РєРѕРјРёС‚СЊСЃСЏ СЃ РґСЂСѓРіРёРјРё РєРѕРЅРєСѓСЂСЃР°РЅС‚Р°РјРё? - Р”Р°, РєРѕРЅРµС‡РЅРѕ Р¶Рµ. РЇ РєР°Р¶РґС‹Р№ РґРµРЅСЊ РїРѕСЃРµС‰Р°СЋ СЃР°Р№С‚ ESCKaz С‡С‚РѕР±С‹ РїРѕР·РЅР°РєРѕРјРёС‚СЊСЃСЏ СЃРѕ РІСЃРµРјРё РЅРѕРІРѕСЃС‚СЏРјРё. РЇ СѓР·РЅР°Р»Р° Р·РґРµСЃСЊ, С‡С‚Рѕ СЏ Р±СѓРґСѓ РІС‹СЃС‚СѓРїР°С‚СЊ 13Р№ Рё СЃ СЌС‚РѕРіРѕ РјРѕРјРµРЅС‚Р° 13 - РјРѕРµ СЃС‡Р°СЃС‚Р»РёРІРѕРµ С‡РёСЃР»Рѕ. - РљР°РєР°СЏ С‚РІРѕСЏ С†РµР»СЊ РЅР° РєРѕРЅРєСѓСЂСЃРµ Р”РµС‚СЃРєРѕРµ Р•РІСЂРѕРІРёРґРµРЅРёРµ? РўС‹ С…РѕС‡РµС€СЊ РїРѕР±РµРґРёС‚СЊ РёР»Рё РїСЂРѕСЃС‚Рѕ РїСЂРѕРІРµСЃС‚Рё С…РѕСЂРѕС€Рѕ РІСЂРµРјСЏ Рё Р·Р°РІРµСЃС‚Рё РЅРѕРІС‹С… РґСЂСѓР·РµР№? - РЇ С…РѕС‡Сѓ РѕР±С‰Р°С‚СЊСЃСЏ, Р·Р°РІРµСЃС‚Рё РЅРѕРІС‹С… РґСЂСѓР·РµР№, РЅРѕ Рё РєРѕРЅРµС‡РЅРѕ, С‡РµСЃС‚РЅРѕ РіРѕРІРѕСЂСЏ, СЏ С…РѕС‡Сѓ РїРѕР±РµРґРёС‚СЊ РЅР° Р”РµС‚СЃРєРѕРј Р•РІСЂРѕРІРёРґРµРЅРёРё. - РўРµР±Рµ РІРѕРѕР±С‰Рµ РЅСЂР°РІРёС‚СЃСЏ РїСЂРёРЅРёРјР°С‚СЊ СѓС‡Р°СЃС‚РёРµ РІ РјСѓР·С‹РєР°Р»СЊРЅС‹С… РєРѕРЅРєСѓСЂСЃР°С…? - Р”Р°, РјРЅРµ РЅСЂР°РІРёС‚СЃСЏ СѓС‡Р°СЃС‚РІРѕРІР°С‚СЊ РІ РЅРёС…, СЏ Р»СЋР±Р»СЋ РїРµС‚СЊ Рё РІС‹СЃС‚СѓРїР°С‚СЊ РЅР° СЃС†РµРЅРµ. - Р�Р· С‡РµРіРѕ СЃРѕСЃС‚РѕРёС‚ С‚РІРѕР№ СЂРµРїРµСЂС‚СѓР°СЂ, РјРЅРѕРіРѕ Р»Рё РІ РЅРµРј РѕСЂРёРіРёРЅР°Р»СЊРЅС‹С… РїРµСЃРµРЅ? - РЈ РјРµРЅСЏ РµСЃС‚СЊ 7 РїРµСЃРµРЅ, РєРѕС‚РѕСЂС‹Рµ СЏ РёСЃРїРѕР»РЅСЏСЋ РЅР° СЂР°Р·Р»РёС‡РЅС‹С… С€РѕСѓ, Р±Р»Р°РіРѕС‚РІРѕСЂРёС‚РµР»СЊРЅС‹С… РєРѕРЅС†РµСЂС‚Р°С… Рё С‚.Рї... РќРѕ, РёРЅРѕРіРґР° СЏ РїРѕСЋ Рё РїРµСЃРЅРё РёР· СЂРµРїРµСЂС‚СѓР°СЂР° РјРµСЃС‚РЅС‹С… РёР»Рё Р·Р°СЂСѓР±РµР¶РЅС‹С… Р·РІРµР·Рґ. - РЈ С‚РµР±СЏ РµСЃС‚СЊ РєСѓРјРёСЂС‹, РёР»Рё РїСЂРѕСЃС‚Рѕ Р»СЋР±РёРјС‹Рµ РёСЃРїРѕР»РЅРёС‚РµР»Рё? РљР°РєРёРµ СЃС‚РёР»Рё РјСѓР·С‹РєРё С‚С‹ РїСЂРµРґРїРѕС‡РёС‚Р°РµС€СЊ? - РЇ Р»СЋР±Р»СЋ РІ РѕР±С‰РµРј С…РѕСЂРѕС€СѓСЋ РјСѓР·С‹РєСѓ. РЇ СЃР»СѓС€Р°СЋ РїРѕРї РјСѓР·С‹РєСѓ, С‚Р°РЅС†РµРІР°Р»СЊРЅСѓСЋ, r-n-b, С…РёРї-С…РѕРї. РњРѕРё Р»СЋР±РёРјС‹Рµ РёСЃРїРѕР»РЅРёС‚РµР»Рё СЌС‚Рѕ РўРѕС€Рµ РџСЂРѕРµРІСЃРєРё, Р•Р»РµРЅР° Р РёСЃС‚РµРІСЃРєР°, Р›Р°РјР±Рµ РђР»Р°Р±Р°РєРѕРІСЃРєРё, Next Time РёР· РњР°РєРµРґРѕРЅРёРё, Р° РёР· Р·Р°СЂСѓР±РµР¶РЅС‹С… - Р РёР°РЅРЅР°, Р‘РµР№РѕРЅСЃ, РЎРµР»РёРЅ Р”РёРѕРЅ, РљСЂРёСЃ Р‘СЂР°СѓРЅ, РњСЌСЂР°Р№СЏ РљРµСЂРё Рё С‚.Рґ. - РљР°РєРёРµ Сѓ С‚РµР±СЏ РїР»Р°РЅС‹ РїРѕСЃР»Рµ РєРѕРЅРєСѓСЂСЃР°? РўС‹ С…РѕС‡РµС€СЊ СЃС‚Р°С‚СЊ РїСЂРѕС„РµСЃСЃРёРѕРЅР°Р»СЊРЅРѕР№ РїРµРІРёС†РµР№? - РЎРµР№С‡Р°СЃ СЏ СѓС‡СѓСЃСЊ РІ 8Рј РєР»Р°СЃСЃРµ Рё РїР»Р°РЅРёСЂСѓСЋ С‚Р°РєР¶Рµ РїСЂРѕРґРѕР»Р¶РёС‚СЊ РѕР±СЂР°Р·РѕРІР°РЅРёРµ РІ РІС‹СЃС€РµР№ РјСѓР·С‹РєР°Р»СЊРЅРѕР№ С€РєРѕР»Рµ, РґРѕРјР° РІ РњР°РєРµРґРѕРЅРёРё РёР»Рё Р·Р°СЂСѓР±РµР¶РѕРј. Р’ Р±СѓРґСѓС‰РµРј СЏ РІРёР¶Сѓ СЃРµР±СЏ РїСЂРѕС„РµСЃСЃРёРѕРЅР°Р»СЊРЅРѕР№ РїРµРІРёС†РµР№, Сѓ РєРѕС‚РѕСЂРѕР№ Р±СѓРґРµС‚ СЃРѕР±СЃС‚РІРµРЅРЅС‹Р№ СЃС‚РёР»СЊ... РєРѕС‚РѕСЂС‹Р№ Р·Р°РїРѕРјРЅРёС‚СЃСЏ РЅР° РјРЅРѕРіРёРµ РіРѕРґС‹. - Р�, РЅР°РєРѕРЅРµС†, РµСЃР»Рё Сѓ С‚РµР±СЏ РµСЃС‚СЊ С‡С‚Рѕ РґРѕР±Р°РІРёС‚СЊ С‡РёС‚Р°С‚РµР»СЏРј, С‚Рѕ С‚С‹ РјРѕР¶РµС€СЊ СЃРґРµР»Р°С‚СЊ СЌС‚Рѕ СЃРµР№С‡Р°СЃ. - РћР±СЏР·Р°С‚РµР»СЊРЅРѕ СЃРјРѕС‚СЂРёС‚Рµ Р”РµС‚СЃРєРѕРµ Р•РІСЂРѕРІРёРґРµРЅРёРµ РІ РљРёРµРІРµ. Р®РЅС‹Рµ Р°СЂС‚РёСЃС‚С‹ РїРѕРјРѕРіСѓС‚ РІР°Рј РїРѕР»СѓС‡РёС‚СЊ Р±РѕР»СЊС€РѕРµ СѓРґРѕРІРѕР»СЊСЃС‚РІРёРµ. РЎ РїСЂРёРІРµС‚РѕРј РёР· РњР°РєРµРґРѕРЅРёРё, РЎР°СЂР° РњР°СЂРєРѕРІСЃРєР°. РЎРѕ СЃРІРѕРµР№ РїРµСЃРЅРµР№ "Р Р°РґРё Р»СЋР±РІРё" СЏ РїРѕСЃС‚Р°СЂР°СЋСЃСЊ Р·Р°РІРѕРµРІР°С‚СЊ СЃРµСЂРґС†Р° РІСЃРµР№ РµРІСЂРѕРїРµР№СЃРєРѕР№ Р°СѓРґРёС‚РѕСЂРёРё. РџРѕРєР°! 13/09 Macedonian broadcaster has informed ESCKaz on the finalized list of participants for the national final, set for September 26th and running order of performances. Hosts of the national preselection will be Ivona Bogeska and Dime Dimitrovski, artistic director of the show is Ljupco Mirkovski. Macedonian representatives at ESC 2009 Next Time will be special guests of the show as well as children dance bands "Mac" from Kumanovo and Rebis and Tatu from Skopje. Р’РµРґСѓС‰РёРјРё РЅР°С†РёРѕРЅР°Р»СЊРЅРѕРіРѕ РѕС‚Р±РѕСЂР° СЃС‚Р°РЅСѓС‚ Р�РІРѕРЅР° Р‘РѕРіРµСЃРєР° Рё Р”РёРјРµ Р”РёРјРёС‚СЂРѕРІСЃРєРё, Р°СЂС‚-РґРёСЂРµРєС‚РѕСЂ С€РѕСѓ Р›СЊСЋР±С‡Рѕ РњРёСЂРєРѕРІСЃРєРё. РџСЂРµРґСЃС‚Р°РІРёС‚РµР»Рё РњР°РєРµРґРѕРЅРёРё РЅР° Р•РІСЂРѕРІРёРґРµРЅРёРё 2009 Next Time, Р° С‚Р°РєР¶Рµ С‚Р°РЅС†РµРІР°Р»СЊРЅС‹Рµ РіСЂСѓРїРїС‹ "Mac" РёР· РљСѓРјР°РЅРѕРІРѕ Рё Rebis Рё Tatu РёР· РЎРєРѕРїСЊРµ Р±СѓРґСѓС‚ СЃРїРµС†РёР°Р»СЊРЅС‹РјРё РіРѕСЃС‚СЏРјРё С€РѕСѓ. РќР°С†РёРѕРЅР°Р»СЊРЅС‹Р№ С„РёРЅР°Р» РїСЂРѕР№РґРµС‚ РІ 3Р№ СЃС‚СѓРґРёРё РњРљРўР’. РџРѕР±РµРґРёС‚РµР»СЊ Р±СѓРґРµС‚ РІС‹Р±СЂР°РЅ СЃРѕРІРјРµСЃС‚РЅС‹Рј СЂРµС€РµРЅРёРµРј Р¶СЋСЂРё Рё С‚РµР»РµР·СЂРёС‚РµР»РµР№. Р’ СЃРѕСЃС‚Р°РІ Р¶СЋСЂРё РІРѕС€Р»Рё: Р”Р°РЅРёРµР»СЊ РўРѕРґРѕСЂРѕРІСЃРєРё, С‡Р»РµРЅ РєРѕРјР°РЅРґС‹ Р”РµС‚СЃРєРѕРіРѕ Р•РІСЂРѕРІРёРґРµРЅРёСЏ 2008, РђРґРё Р�РјРµСЂРё, РїСЂРµРїРѕРґР°РІР°С‚РµР»СЊ РіРёС‚Р°СЂС‹ РІ С€РєРѕР»Рµ "I.N.Luj", РњРµСЂРё РџРѕРїРѕРІР°, СЂРµРґР°РєС‚РѕСЂ РјСѓР·С‹РєР°Р»СЊРЅС‹С… РїСЂРѕРіСЂР°РјРј MRT, РЎР°С€Р° РќРёРєРѕР»РѕРІСЃРєРё, РґРёСЂРёР¶РµСЂ Рё РђРґРЅРё Р§Р°Р»РјРё, СЂРµРґР°РєС‚РѕСЂ СЂР°Р·РІР»РµРєР°С‚РµР»СЊРЅС‹С… РїСЂРѕРіСЂР°РјРј РІС‚РѕСЂРѕРіРѕ РєР°РЅР°Р»Р° РјР°РєРµРґРѕРЅСЃРєРѕРіРѕ С‚РµР»РµРІРёРґРµРЅРёСЏ. РњР°СЂРёСЏ Р—Р°С„РёСЂРѕРІСЃРєР° РїСЂРёРЅРёРјР°Р»Р° СѓС‡Р°СЃС‚РёРµ РІ РѕС‚Р±РѕСЂР°С… 2007 Рё 2008 Рё РІС‹СЃС‚СѓРїР°Р»Р° РЅР° СЃС†РµРЅРµ Р РѕС‚С‚РµСЂРґР°РјР° РІ Р±СЌРє-РіСЂСѓРїРїРµ Р”РёРјРёС‚Р°СЂР° Рё Р РѕСЃРёС†С‹, РЎР°СЂР° РњР°СЂРєРѕРІСЃРєР° - РІ 2007 Рё С‚Р°РєР¶Рµ РІС‹СЃС‚СѓРїР°Р»Р° РІ Р РѕС‚С‚РµСЂРґР°РјРµ, Р¤РёР»РёРїР° Р‘РёР±Р°РЅРѕРІСЃРєР° РїСЂРёРЅРёРјР°Р»Р° СѓС‡Р°СЃС‚РёРµ РІ РѕС‚Р±РѕСЂРµ 2008, Р° РІ 2007 РіРѕРґСѓ Р¤РёР»РёРїР°, Р”РµСЏ Рё РўРµР° Р±С‹Р»Рё РЅР° РїРѕРґС‚Р°РЅС†РѕРІРєРµ Сѓ СЂСЏРґР° СѓС‡Р°СЃС‚РЅРёРєРѕРІ РєРѕРЅРєСѓСЂСЃР°. 14/07 Macedonian national broadcaster has exclusively informed ESCKaz on details of the national preselection. At the moment submission period is underway and the deadline has been set for August 1st. Professional jury will select 12 entries to take part in the national final. It has been scheduled for September 26th at 20:15, with live broadcast on MKRTV 1 and MKRTV Sat. The draw of the order of performances will be done live on September 4th in youth programme of the channel "Dzvon". РњР°РєРµРґРѕРЅСЃРєРёР№ РЅР°С†РёРѕРЅР°Р»СЊРЅС‹Р№ С‚РµР»РµРєР°РЅР°Р» СЂР°СЃСЃРєР°Р·Р°Р» СЌРєСЃРєР»СЋР·РёРІРЅРѕ ESCKaz Рѕ РґРµС‚Р°Р»СЏС… РїСЂРѕРІРµРґРµРЅРёСЏ РЅР°С†РёРѕРЅР°Р»СЊРЅРѕРіРѕ РѕС‚Р±РѕСЂР°. Р’ РЅР°СЃС‚РѕСЏС‰РµРµ РІСЂРµРјСЏ РїСЂРѕС…РѕРґРёС‚ РїСЂРёРµРј Р·Р°СЏРІРѕРє РЅР° СѓС‡Р°СЃС‚РёРµ РІ РЅРµРј, РєРѕС‚РѕСЂС‹Р№ РїСЂРѕРґР»РёС‚СЃСЏ РґРѕ 1РіРѕ Р°РІРіСѓСЃС‚Р°. РџСЂРѕС„РµСЃСЃРёРѕРЅР°Р»СЊРЅРѕРµ Р¶СЋСЂРё РІС‹Р±РµСЂРµС‚ 12 РїРµСЃРµРЅ, РєРѕС‚РѕСЂС‹Рµ РїСЂРёРјСѓС‚ СѓС‡Р°СЃС‚РёРµ РІ С„РёРЅР°Р»Рµ, РЅР°Р·РЅР°С‡РµРЅРЅРѕРј РЅР° 26 СЃРµРЅС‚СЏР±СЂСЏ, РєРѕС‚РѕСЂС‹Р№ Р±СѓРґРµС‚ РїРѕРєР°Р·Р°РЅ РІ РїСЂСЏРјРѕРј СЌС„РёСЂРµ РІ 22.15 РњРѕСЃРєРІС‹ РЅР° С‚РµР»РµРєР°РЅР°Р»Р°С… MKRTV 1 Рё MKRTV Sat. Р–РµСЂРµР±СЊРµРІРєР° РїРѕСЂСЏРґРєР° РІС‹СЃС‚СѓРїР»РµРЅРёР№ РїСЂРѕР№РґРµС‚ РІ РїСЂСЏРјРѕРј СЌС„РёСЂРµ 4РіРѕ СЃРµРЅС‚СЏР±СЂСЏ РІ СЂР°РјРєР°С… РґРµС‚СЃРєРѕР№ РїСЂРѕРіСЂР°РјРјС‹ "Р”Р·РІРѕРЅ".